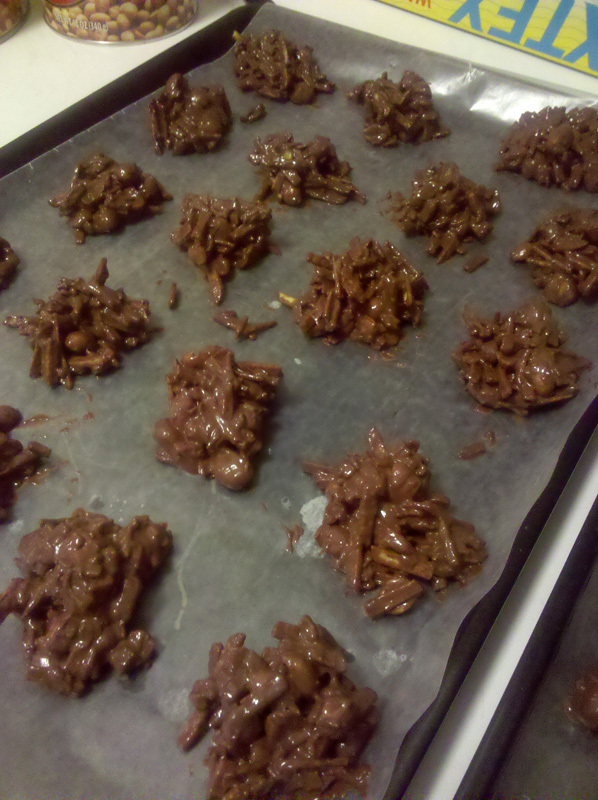 Tumbleweeds are: Chocolatey, peanut buttery, potato sticky, peanuty goodness. Bite-sized and perfectly portable, you can make them with chow mein noodles, toss in butterscotch chips, and substitute almond bark. 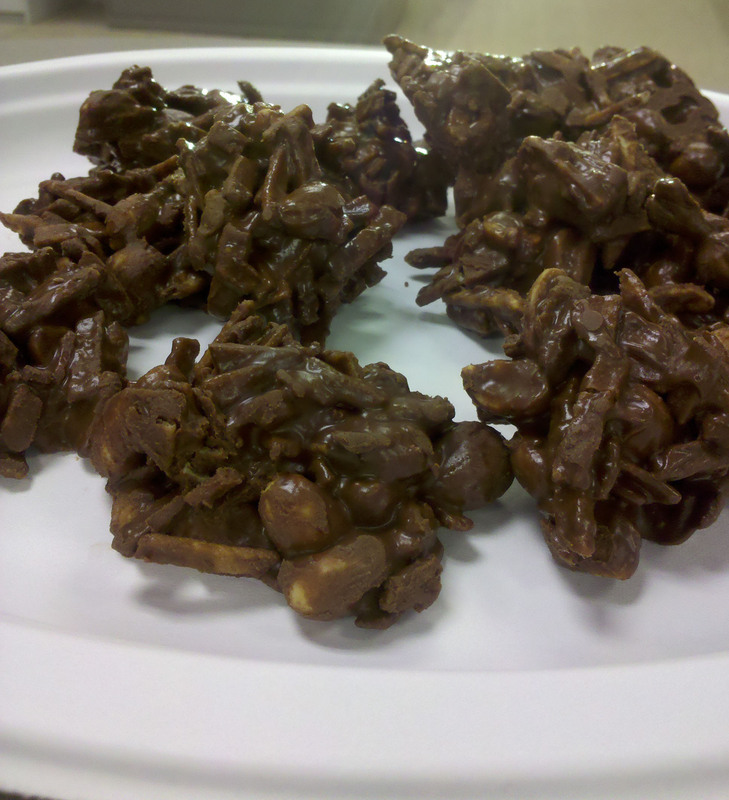 Ever hear of Haystacks? Same thing! Here’s how I make mine. Cautionary Note: It’s only natural to sample each ingredient to make sure it’s okay; after all, you don’t want to poison people. Just don’t make these before dinner or the sampling rate may increase alarmingly. 1. 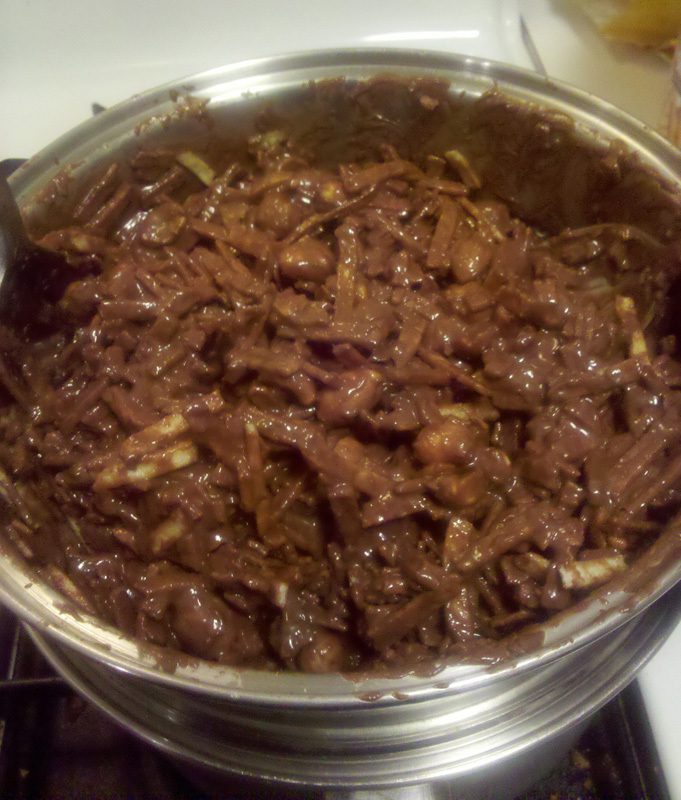 Start the double boiler on the stove. 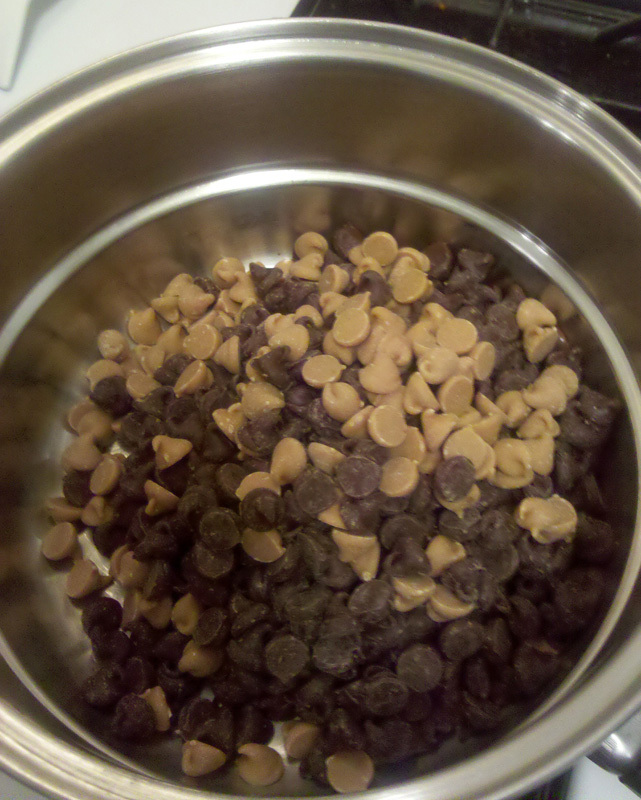 Add the chocolate chips and peanut butter chips a little at a time until both bags are used up, stirring constantly to prevent burning or sticking to the pan. 2. When you have a nice thick unlumpy goo, turn off the heat. 3. 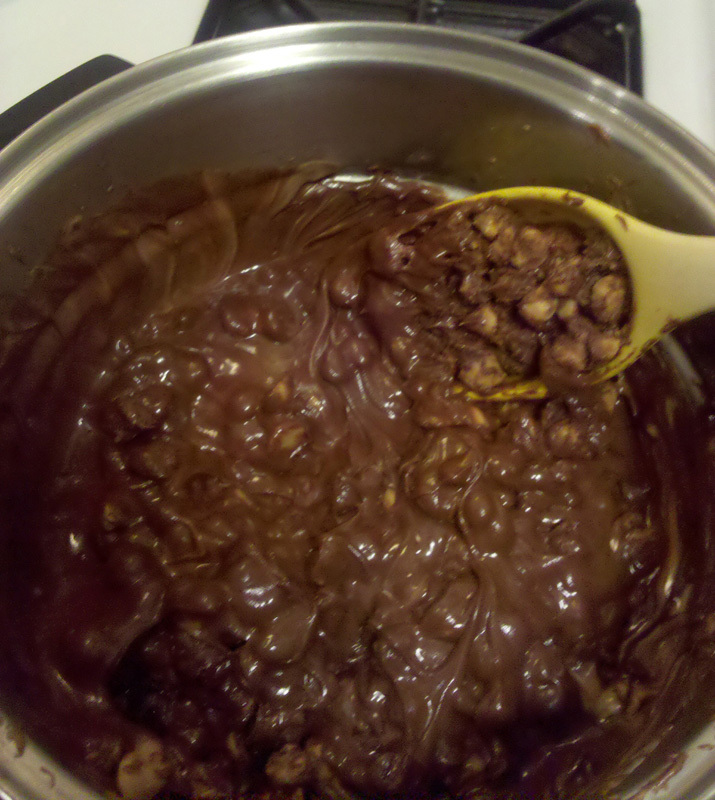 Start adding the potato sticks and peanuts a handful at the time and stir into the mixture so they are saturated with the chocolate-peanut butter chip mix. 4. Stop adding the potato sticks and peanuts when the mixture will no longer cover all the pieces. 5. Lay waxed paper on cookie sheets. Using two tablespoons, scoop out small- to medium-sized clumps of the mixture onto the waxed paper. 6. Let “set” and dry. 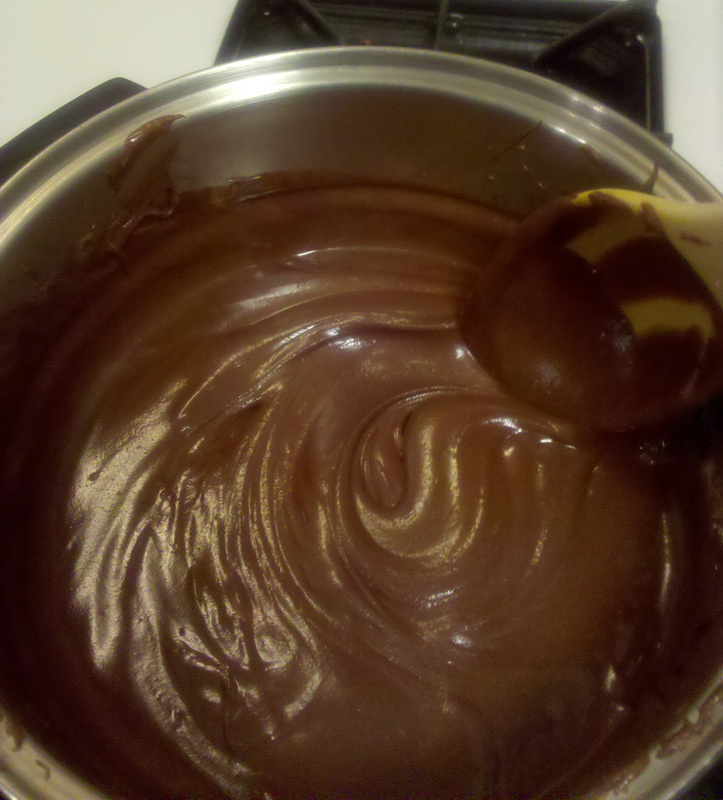 Full drying time can take an hour or more; look for the chocolateyness to stop glistening. Note: Sampling may be done earlier if you can’t help yourself, but the Tumbleweeds may fall apart. You may find this won’t matter to you. ← #Scintilla Day 2: I Couldn’t Do It Without You. Ever.